Bishop Vincent Long ordains to the Priesthood Galbert Albino, Jessie Balorio, Chris del Rosario and Jack Green. Over 1,400 people witnessed the ordination of four new priests at St Patrick’s Cathedral, Parramatta on Friday, 30 November 2018. Deacons Galbert Albino, Jessie Balorio, Chris del Rosario and Jack Green were ordained to the priesthood on the feast of St Andrew in a historic event for the Catholic Church in Western Sydney and the Blue Mountains. The ordinations were the first time four deacons have been ordained to the priesthood since the establishment of the diocese in 1986. Most Rev Vincent Long OFM Conv, Bishop of Parramatta, was the principal celebrant and ordaining prelate for the Mass. Concelebrating was Most Rev Anthony Fisher OP, Archbishop of Sydney, Most Rev Robert McGuckin, Bishop of Toowoomba, Most Rev Richard Umbers, Auxiliary Bishop of Sydney, Very Rev Peter G Williams and Very Rev Chris de Souza, Vicars General of the Diocese of Parramatta, diocesan clergy and visiting clergy from other dioceses. 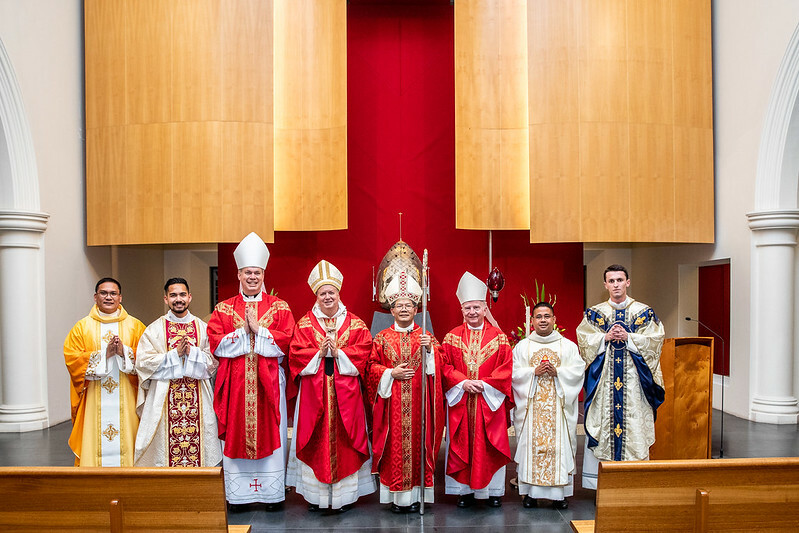 In his homily, Bishop Vincent made known how grateful he was to be able to celebrate the ordination of four priests from Holy Spirit Seminary, the diocesan seminary. “It is with great joy and gratitude to God that we have come to celebrate this historic occasion in the life of our young diocese,” Bishop Vincent said. “Jessie, Galbert, Jack and Chris. Your priestly ordination tonight is a sign of hope and renewal of God’s everlasting love to his people. “The Church in Parramatta and beyond is rejuvenated by your youthfulness, reinvigorated by your commitment and enriched by your gifts. “We pray that Christ’s self-sacrificial love which you will celebrate daily at the altar, will nourish and strengthen you on the journey that you have just begun. Members of the ordinands’ families were involved in the ceremony, with Jack’s sister Anna and Chris’ brother Clemens proclaiming the readings and Jessie’s mother Catalina and Galbert’s mother Expedita presenting the gifts at the Offertory. Fr Chris del Rosario in his Note of Gratitude, on behalf of the ordinands, thanked Bishop Vincent for a day the four of them would never forget. Fr Chris also thanked their fellow priests, Fr John Hogan, the rector of the Holy Spirit Seminary, seminarians and their respective parish communities who have been with them through their journey to priesthood. Finally, Fr Chris wished to thank the families of all four priests. “To our parents, thank you bringing us to the faith at an early age and nurturing it throughout our lives. “Who would have thought that the gift of faith in baptism all those years ago would eventually lead to the gift of the priesthood for your sons. “Thank you for unconditional love and support, the many sacrifices you’ve made over the years and your constant guidance. Following the Mass, the newly ordained priests gave their first blessings in the Cathedral Chapel to members of their families, the clergy, seminarians and Bishop Vincent. Refreshments were served in the Cathedral Hall following the Mass. Fr Galbert, who was ordained to the Deaconate on 25 November 2017, will become the Assistant Priest of St Aidan’s Parish, Rooty Hill. Fr Jessie, who was ordained to the Diaconate on 12 May 2018, will become the Assistant Priest of St Monica’s Parish, Richmond. Fr Jack, who was ordained to the Diaconate on 2 June 2018, will be assigned to Mary, Queen of the Family Parish, Blacktown. Fr Chris, who was ordained to the Diaconate on 26 May 2018, will become Assistant Priest at St Patrick’s Cathedral, Parramatta. 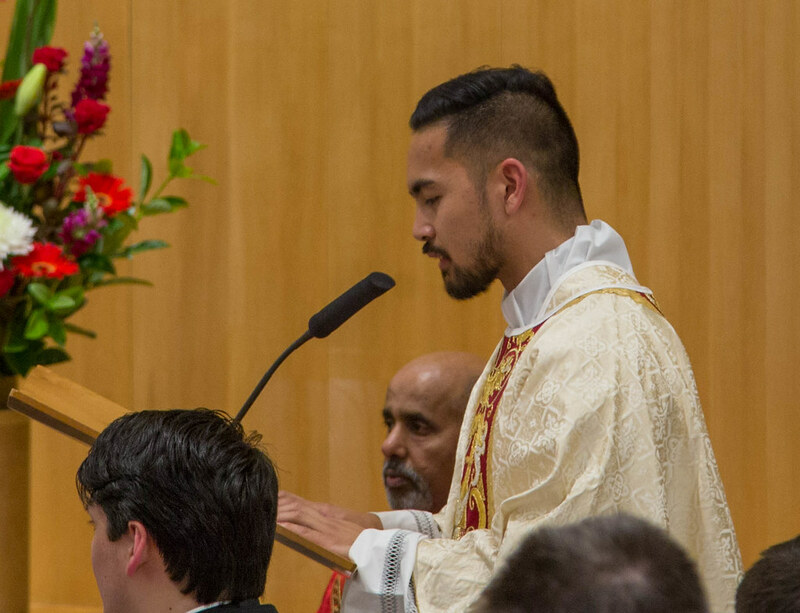 VIEW: Images from the ordination below or here.